These funnel cakes are pretty amazing and are totally worth the effort of making choux paste. If you haven’t used or made choux paste before, it’s the same dough that’s used to make éclairs, profiteroles, and churros. 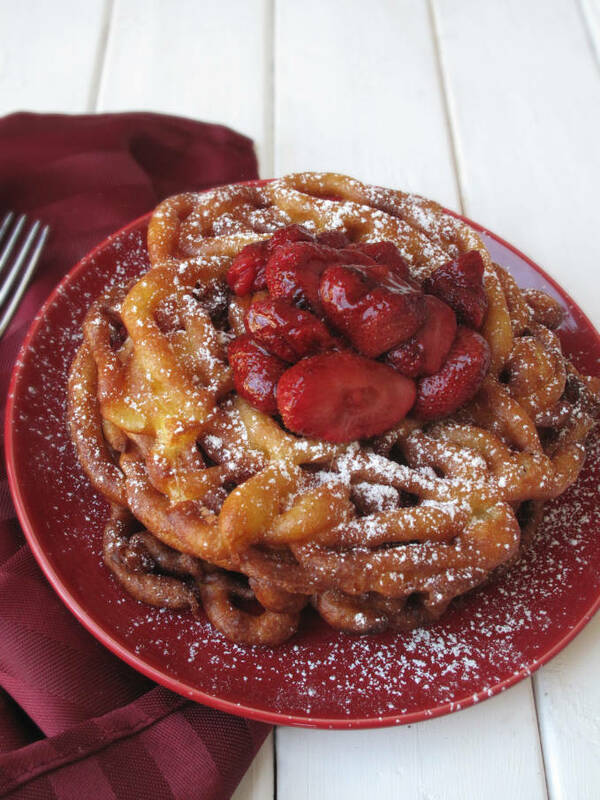 These funnel cakes have a light and fluffy center that is protected by a thin, crispy coating. They only need to cook for a few minutes per side until they turn golden brown and are ready to be dusted with a bit of icing sugar (or more) and topped with a heaping spoonful (or more) of fresh, warm Canadian strawberries and strawberry sauce. Add ice cream for an extra special treat! Or you could just eat them plain. 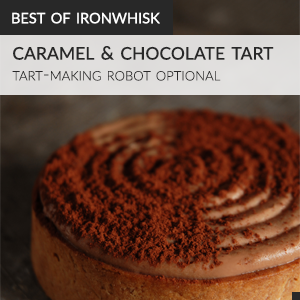 You shouldn’t – you really should eat them with something. Creating the classic funnel cake shape might look difficult, but the beauty of funnel cake is that it isn’t difficult at all. You can fill up a funnel, while holding the bottom to prevent batter leaking out, and then remove your finger while moving the funnel over the pan. You could also fill up a plastic bag with choux paste, snip off the end, and press on it while moving the bag over the pan. Of course, you could always use a piping bag with a large round tip too. Regardless of which option you choose, pour the batter as close to the hot oil as possible so that it doesn’t splatter and burn you. Although the burns may be worth a fresh funnel cake, it’s still best to avoid them. Don’t they just look delicious? Yes, yes they do. That’s why you’re going to run to the kitchen and make them right now. I don’t care if you don’t have strawberries or if you have a doctor’s appointment. There is no excuse not to make these right now. Unless of course you’re – nope, none. Chop, chop. Note (2017/08/10): If you want to make the best possible funnel cake, you may wish to view my tutorial on making the perfect éclairs. Follow the recipe there to prepare the choux dough, but fry it according to the instructions below. The recipe here still works quite well! The detailed steps/added complexity in the tutorial are most applicable for baking choux pastry, not frying it. However, they do make the funnel cake just slightly better. Funnel cake is the ultimate carnival treat. This recipe uses choux paste instead of regular pancake batter for a fluffier, more delicious option at home. In a bowl sift together the flour, sugar and salt. Set aside. Place the butter and water in a heavy saucepan over medium heat and bring to a boil. Remove from heat and, with a wooden spoon or spatula, quickly add the flour mixture. Return to heat and stir constantly until the dough comes away from the sides of the pan and forms a thick smooth ball. Transfer the dough to your electric mixer, or with a hand mixer, and beat on low speed a minute or two to release the steam from the dough. Once the dough is lukewarm start adding the lightly beaten eggs and continue to mix until you have a smooth thick paste. Using a piping bag with a round tip, pipe the smooth dough into hot oil (around 350°F) on medium heat in a small pan. 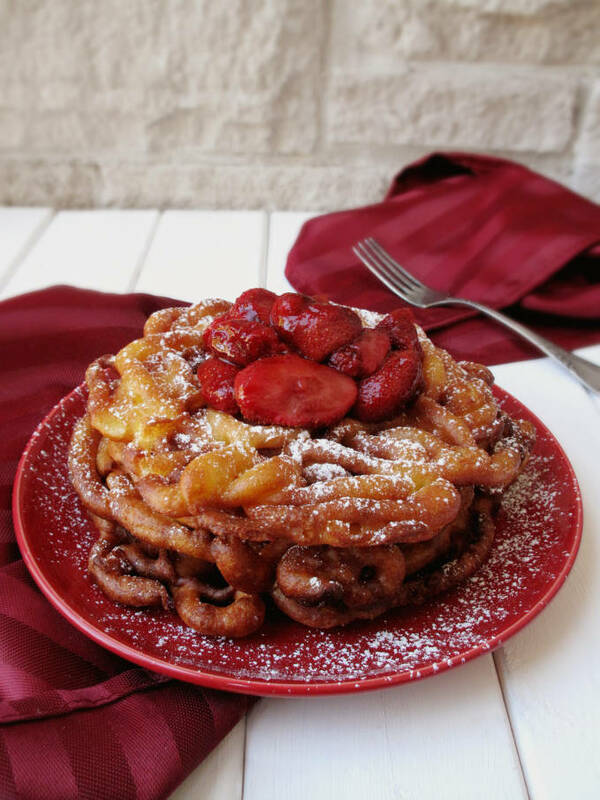 If you use a smaller pan and cook one at a time you will get similarly sized funnel cakes. Pipe zig-zag shapes and circles around the pan. 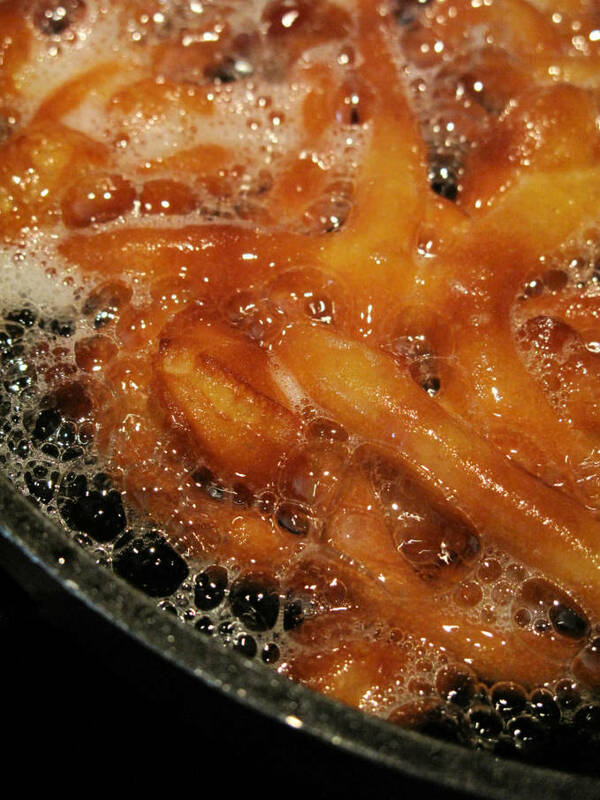 Make sure the oil is hot or the funnel cake will be hard instead of crispy. If the funnel cake gets brown too fast, turn down the heat or it will burn. Fry until golden brown, about two to three minute per side. Drain the funnel cakes on paper towels. Combine everything but the icing sugar in a saucepan and cook on medium heat until the strawberries are soft, about fifteen minutes. Using a sieve dust the funnel cakes with icing sugar. Top with strawberries and ice cream. Yours look so perfect! I would never be able to pull that off! Haha, I love the advice on avoiding burns. Your red napkin and plate compliment those lovely strawberries so perfectly! Looks great. I really appreciate how good this dessert looks. Fantastic photos, and great instruction. Thanks! I never had funnel cake until I moved to Tennessee a billion years ago to go to university. One weekend I went to Gatlinburg and they had funnel cakes. I ended up with greasy fingers, icing sugar all ovr me and a big smile! YUM! Looks delicious! 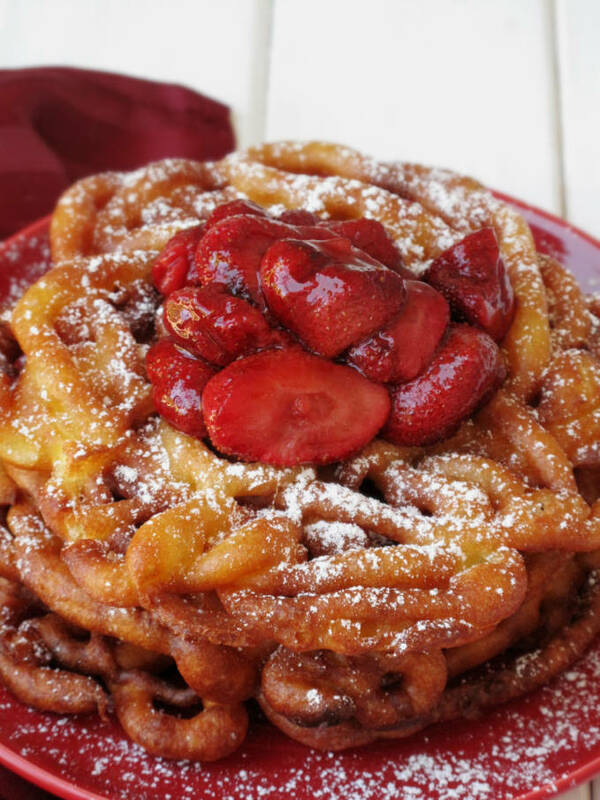 There is never an excuse to not make funnel cake! I haven’t been to a state fair in years, but the funnel cake was always my go to treat! Looks delicious! “…it’s not funnel-flavored.” Um, what does a funnel taste like? Similar to plastic race cars, I assume. Wow, I have the same red plates, and now I know how good they can look. Can’t wait to give these a try. Wonderful pictures………..almost good enough to eat! Can these be made the day before and stored in the refrigerator? Does the batter have to be warm when cooking? Help!! I wouldn’t suggest making them early and storing them in the fridge because they’ll get soggy. In fact, they’re best eaten right away. The batter should be room temperature, yes. Let me know how it goes! When I was a kid going to the county fair we got funnell cakes covered in chocolate syrup and powdered sugar. They called them ‘cow pies’. Best food memory ever. 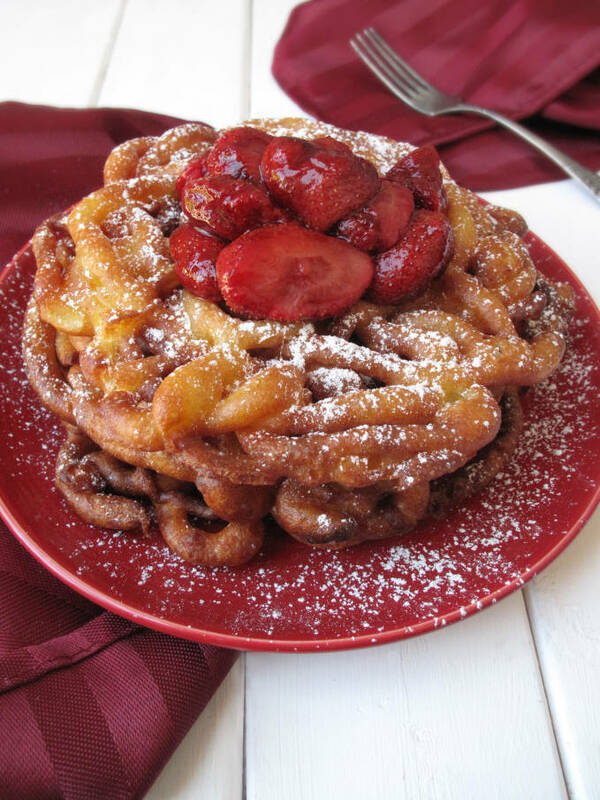 I love funnel cakes and want to make these. But how can one person eat 38 of them at one sitting, since keeping them will make them soggy? Can you keep the batter in the fride for any length of time? I froze the funnel cakes once, and froze them, not crispy, but still tasted yummy. Hi Karen, I suggest making the funnel cakes fresh for best results and so you shouldn’t keep the batter in the fridge. Vanilla easiest to say “to taste” or “a splash” there’s so little. Ditto strawberries. Do you know what the nutritional information is for this recipe? Hi Cecelia, no, sorry! But it’s safe to assume everything on here isn’t very healthy. I’ve had funnel cakes at carnivals and fairs and I absolutely love them. They usually serve them with a squeeze of fresh lemon and powdered sugar. Never had them with strawberries. I LOVE strawberries, so can’t wait to try this. I’ve made these every fourth sunday for my family never seems like I can make them fast enough . Then too on that sunday I have more than just my nine boys but each times three. Four every boy you have you have three they have their best dude then a kick around dude. My family never misses a sunday , topping my funnels with fresh fruit from our own trees is the best way I know. Have fun with the toppings enjoy one meal a month with your famly they wake to the best breakfest ever I’m told. Thanks for the info! I’m going to cook these BEFORE I start my diet this weekend!